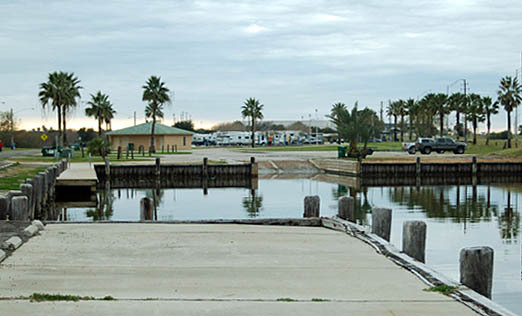 There are two boat ramps located in Port Lavaca to access Lavaca Bay. A third is located outside of town at the Refuge Harbor (south of town on Hwy 1090). Above: This is the Port Lavaca boat ramp located at the Pier Park along Hwy 35. There is a small fee to enter the park that includes boat launching. Leaving the ramp by boat, the Lavaca Bay Causeway will be to the left side and the "new" fishing pier to the right. Caution: Beyond the new pier there are remnants of the old pier still standing and also submerged below the water line. The old pier extended from the Port Lavaca side to within perhaps 300 yds of the channel (High hump of the causeway). Extending beyond the old pier and to the right is Chicken Reef. Fishermen once could walk to the end of the mile long pier to access the reef. Now it's by boat only. This is a little known hot spot for big trout (Feb-May) and good fishing when the water is green. This Port Lavaca ramp is located at the end of Main Street near the fishing pier. This area is scheduled to undergo a major upgrade which will include ramp improvements and better public facilities. The historic Navidad Hotel (Currently undergoing restoration and looking very good 7/07) is seen in the background.